Enjoy the awesome selection of fabrics to express your personality with do rags, bandanas, patches, welders caps, cooling cool ties, baby items, crochet items, and knitted items. As Always U.S. First Class Domestic Shipping is FREE! All international orders need to purchase shipping found on the "Shipping Options" page. This will avoid delays in receiving your order. I hand make everything, so shipping averages between 5-10 days, and since I have listed so many fabrics for you to choose from, some of them will have to be ordered at the time that you place your order. This could delay shipment to approximately 2 weeks depending on my supplier and the postal service, but I always try for sooner than later. I try to keep up with fabrics that I have listed as to them being in stock, but I do occasionally miss one. If I have missed something and the item is out of stock and you need sooner than I can get the fabric, I will be happy to refund your order. As always, thank you and I appreciate your patience in receiving you order! 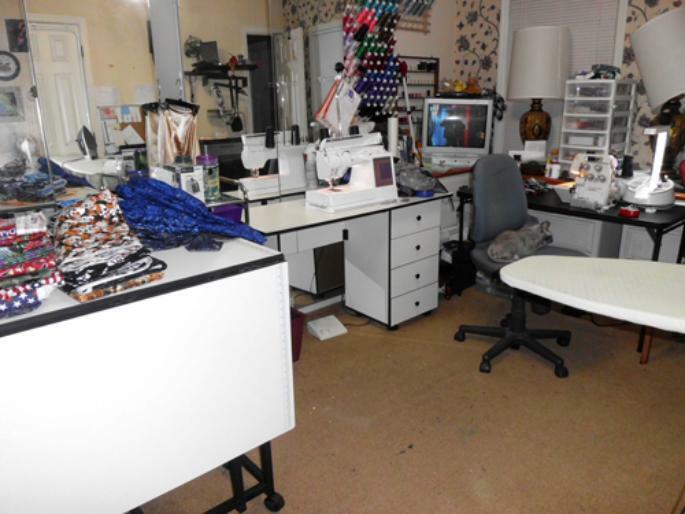 This is my workroom, where the magic is done to create your do rags and crochet items. I spend a lot of time in this room, but I truly enjoy making everything for you. I even got a shot of my kitty sitting in my chair. Have fun displaying your personality through custom made do rags from AwesomeDoRags. Allow us to custom make your do rags for you. All are made from 100% cotton fabrics. Any do rag can be enhanced with Swarovski crystals or a short saying can be embroidered onto a solid color band. As always, U.S. Domestic First Class Shipping is FREE! 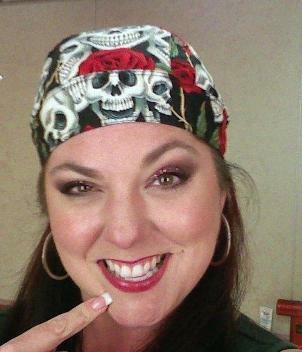 Tonya enjoys showing off her sassy side with our do rags. There are five (5) different styles to choose from, see the "Description of Products" page for full explanations and pictures.